Directed by Sam Mendes. Running Time: 143 minutes. Cert: 12. Starring: Daniel Craig, Javier Bardem, Judi Dench, Naomie Harris and Ralph Fiennes. It’s official. Bond is back. I will try not to let the fact that I am a huge fan of the iconic English spy cloud my judgement of the latest espionage venture, titled Skyfall. As Daniel Craig’s third outing as James Bond, we see him travel to Istanbul to recover a stolen hard drive which contains the identities of undercover NATO operatives. When MI6 comes under attack, Bond must confront Raoul Silva (Bardem), a global criminal mastermind hell bent on revenge. Bond has always come across as the suave, virile womaniser who’s nothing short of perfect. While I’m not the biggest fan of Craig as Bond (it’s the hair, really!) Skyfall does provide us with a susceptible, weaker and more humane James Bond that has seldom been explored in previous films. After a mishap leaves Bond missing-in-action, presumed dead, he ekes out a living in Turkey indulging in alcohol and sexual encounters. Craig’s Bond is devoid of any emotion, offering only a single smouldering look which leaves the audience reeling for more of the bravado composure we are so used to seeing in Bond. While it is pleasant to see this fragility, I never thought that it would pour into the obligatory less-than-impressive love scene. A quick kiss in the shower and it’s all over. Gone are the days when Bond slept with the antagonistic Bond girl to whom he’d disclose all his secrets to! I was left feeling disappointed and wondered how Sam Mendes would make up for this awful blunder. Then along came Raoul Silva. We meet the main antagonist about half way through the film. A bit long to wait for the main action to commence, but it is worth it. Bardem’s portrayal of Silva is the perfect blend of corruption, charm and downright creepiness. A previous MI6 agent, Silva now seeks redemption and revenge on M. Silva is the Bond villain that leaves that lasting impression on the observer long after they leave the cinema. This is not done through any type of gadget or henchmen, but through his own light, camp humour he manages to steal the show. As humour appears to be deficient in Craig’s Bond (and other sort of puns), this light humour is manifested in Silva, which makes him all the more impendent, rather than just being a camp man attempting to emasculate Bond. Introducing a new Q was risky: would he match the sheer brilliance brought to the role by Desmond Llewelyn? The answer is…yes and no. At the end of the day, it’s not fair to compare two very contrasting actors who both bring something different to the role. Who can forget Q barking “Don’t touch that! That’s my lunch!” The Q we have here today is a young computer geek trying to establish some sort of relationship with Bond. Although Bond has been around since before he was born (and he knows it! ), Ben Whishaw’s portrayal of Q is satirical but truthful. He’s tech savvy and presents Bond with one single gadget. 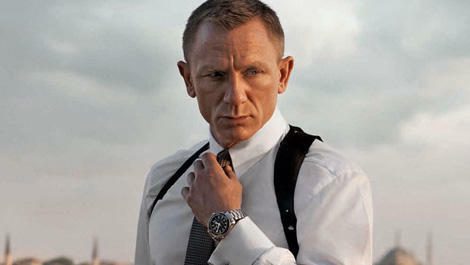 If no gadgets were itroduced, Skyfall would have failed as a Bond film. The same can be said with Bond’s car. The infamous Aston Martin DB5 appears immediately followed by the James Bond theme song. The opening credits were superb. The eagerly anticipated song Skyfall is remarkably perfect for this film. It sounds like a pastiche of past Bond songs yet it’s refreshingly new with Adele belting through the chorus. Although there were some missed opportunities for some “Bondesque” humour, the screenplay was well written and the characters developed to their full potential under Mendes’ direction. Skyfall most certainly sets the scene for the next installment. It is safe to say that James Bond will return. I partcularly like the parts about m and the fact that she is the ultimate bond girl (It was funny)and also the analysis of silva was also really cool. I look forward to reading more!